Box Elder Bugs are notorious for invading homes, especially when the temperatures dip. You likely recognize the box elder bug as the red and black bugs that are about one half inch long that can really stink if they are smashed. They seek shelter in protected locations indoors (like inside your home) to survive cold temperatures. Because of their numbers and the foul odor they emit when crushed, it is difficult for homeowners to get rid of them for good — especially when multiple box elder bugs invade your home. Eco Tech, a Ramsey, MN Exterminator, can help remove box elder bug problem once and for all! For many months of the year, the box elder bugs are content to congregate on box elder trees and mate. That is why you do not notice infestation in your home during warmer months. You will notice these bugs coming inside when the temperatures are colder in Minnesota. These bugs are completely harmless to humans and do not carry disease, but can be quite a pain to get rid of. In addition to the foul odor that they emit when they are crushed, they can also stain walls and furniture. 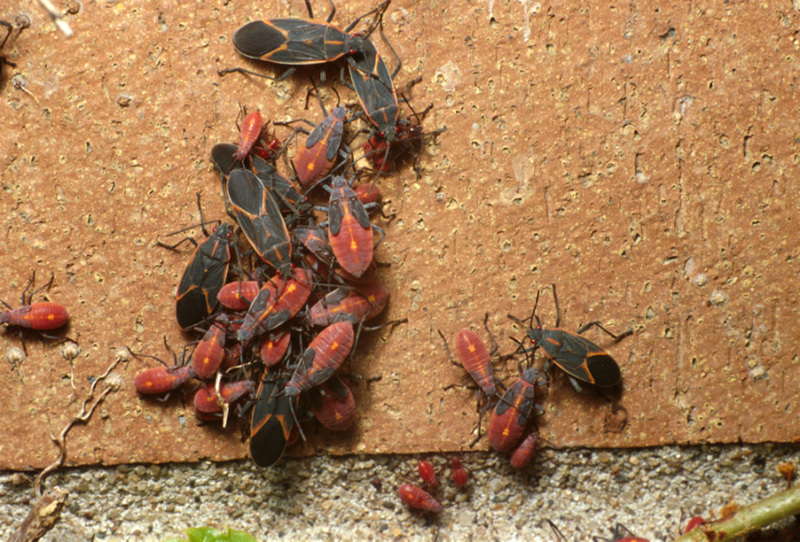 Rather than giving these box elder bugs a safe shelter with you in your home, hire a professional exterminator to eliminate the problem and the annoyance. Eco Tech guarantees that they can get rid of all box elder bugs in your home. Using a less toxic, organic products, our crew can quickly and safely rid your home of box elder bugs or any other pests. Eco Tech has been in the extermination business for more than 15 years and our success hinges on being sensitive to using less toxic products to ensure that the health of your children and pets are not compromised. The Eco Tech team is made up of honest, reliable, on-time, and friendly crew that are a pleasure to deal with. We do not require contracts to be signed for our services unless our customers request it. Finally, we offer our customers a four-year service warranty on all of our pest control plans…which is stronger than any other local extermination company! Do not let box elder bugs take up residence in your home this year – call Eco Tech today at 1-763-785-1414 to schedule an appointment.